There is a small two berth cabin forward and between it and the wheelhouse aft there are two single berths either side of a low passageway. Access is gained via either of two hatches. Fisher boats are renowed for their rugged construction and seaworthness. This Fisher 25 is very unusual in that it is not the standard design but rather the Potter Weekender. As the name implies this boat has all the excellent qualities of a Fisher boat but has the weekender accommodation for four people. A small galley in the wheelhouse, a seatoilet, plenty of deck space, ketch rigged and with an excellent 35Hp Beta engine this is a great little package. She needs to be tidied up and finished off, but otherwise appears to be a good boat. 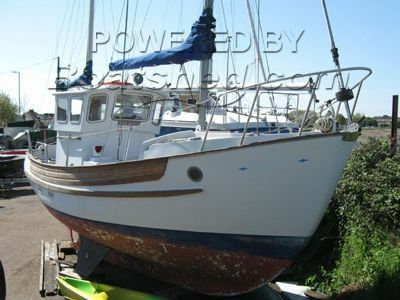 This Fisher Potter 25 has been personally photographed and viewed by Stephen Grimshaw of Boatshed Torquay. Click here for contact details. Please note this comments section is public. Please do not post your personal details here. Please read our commenting guidelines before posting.